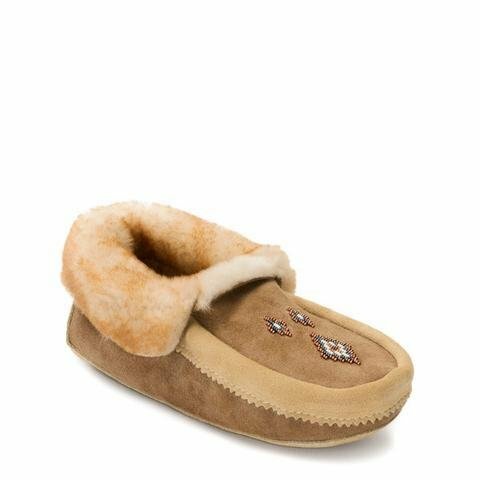 These suede moccasins feature a Sheepskin Shearling Lining and a suede sole. There are many benefits associated with wearing sheepskin shearling; the Red River Moccasin will keep your feet warm, comfortable, and dry. This classic moccasin silhouette has been passed down from generation to generation. Our ancestors originally designed these out-turned sheepskin moccasins to wear indoors through harsh Canadian winters. Now we continue the tradition by combining modern techniques and materials to make them cozy additions to your everyday life around the house or at the cottage!